What’s the secret formula for achieving success? A creative Prezi Next presentation template with a blue glass science beaker and circle topics inside it. Zoom in and make a presentation about chemistry, science, biology or any other success formula. Describe the right mixture needed to achieve success and drink it! The presentation starts with an overview of a glass test tube filled with a blue liquid on a light blue background. 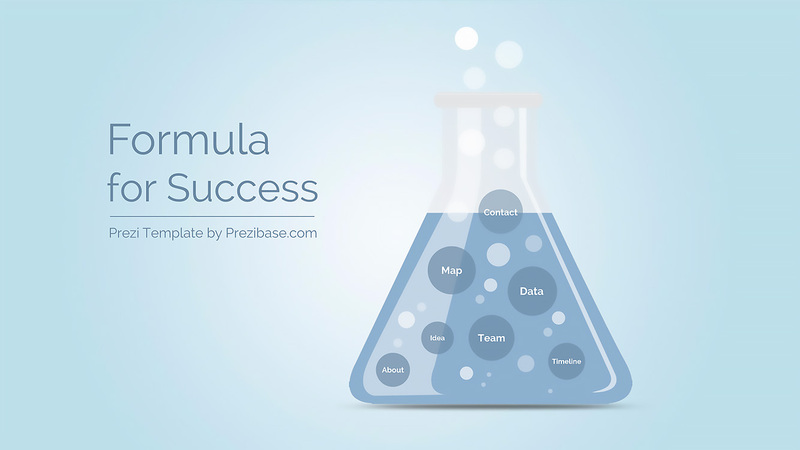 The beaker is filled circular topic titles and air bubbles which illustrates the concept that success requires many ingredients to make it react or work! The overview slide also has a large text placeholder for your presentation title and subtitle. You can easily move the elements around, change the colors of the topic circles and add your own background. Duplicate the circles to add more placeholders for your presentation. A great template for making a fun science themed presentation, especially for the younger audience. Present about a medical and science related company or use the concept for a more general topic. 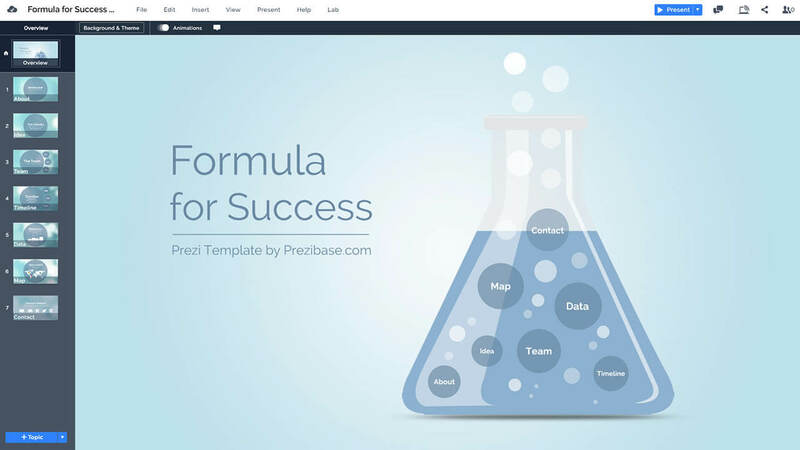 The Prezi zoom effect gives a nice opportunity to explore a topic by individually focusing and zooming into the circles, revealing all the “ingredients”. So put on your alchemy hat and start experimenting, you might not discover the elixir of life, but an interesting presentation is also a good reward! This entry was posted in Best Prezi presentation templates, Prezi Next Templates and tagged biology, chemical, chemistry, computer science presentation templates, data science presentation template, dna, formula, glass test tube, medical test presentation, prezi next template, prezi next templates, science beaker, science poster presentation template, science powerpoint templates free download 2016, science presentation, science presentation format, science presentation layout, science presentation template, science presentation template google slides, science presentation template powerpoint, science project presentation template, test tube.